The clear signs given to the world for decades of the approaching Judgment and my reappearance did not truly receive attention by the media and the world because of negligence, poor communication, deceptions, “other priorities” and the world having difficulties “believing” in what most did not hear about (!) or decided had to be “hoaxes”. “My light” in the Heavens is the light of an UFO, which since Christmas 2008 has appeared around the world to herald my emergence. These statues and icons of my mother and I weep because of our increasing sufferings taking on the sins of man to save the world from ending. 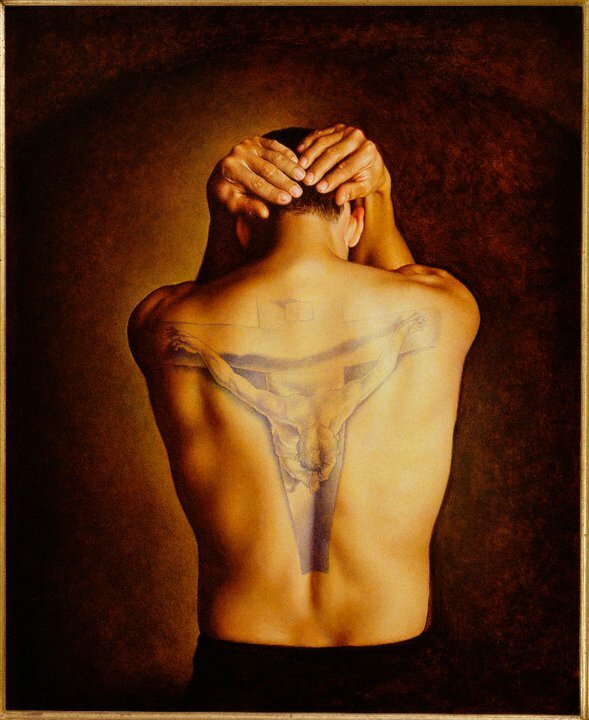 Stigmata are bodily marks reminiscent of the five wounds of Christ and the crown of thorns. The name has its origin from my name, STIG and the signs mean: The sins of mankind was killing me thus terminating all life (if I had not created a New World), please improve :-). 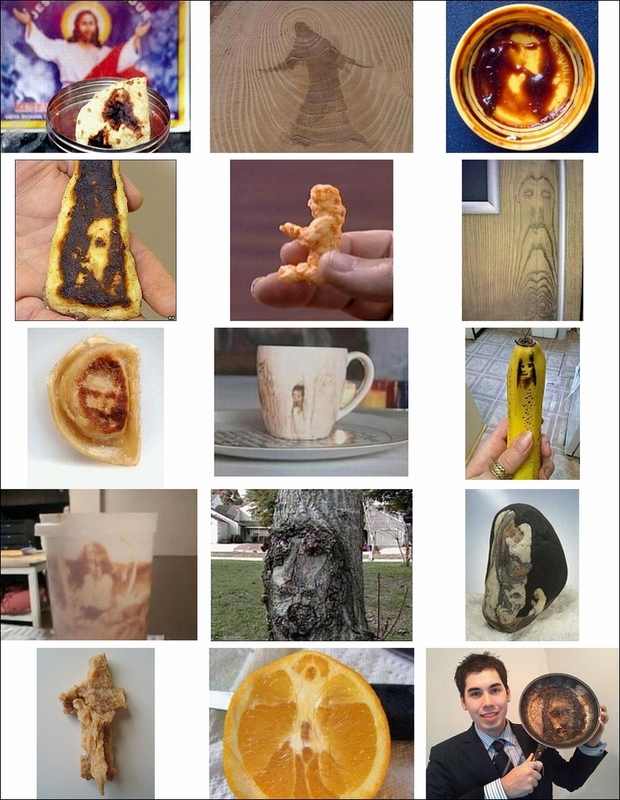 Images appearing “miraculously” in food and other objects. 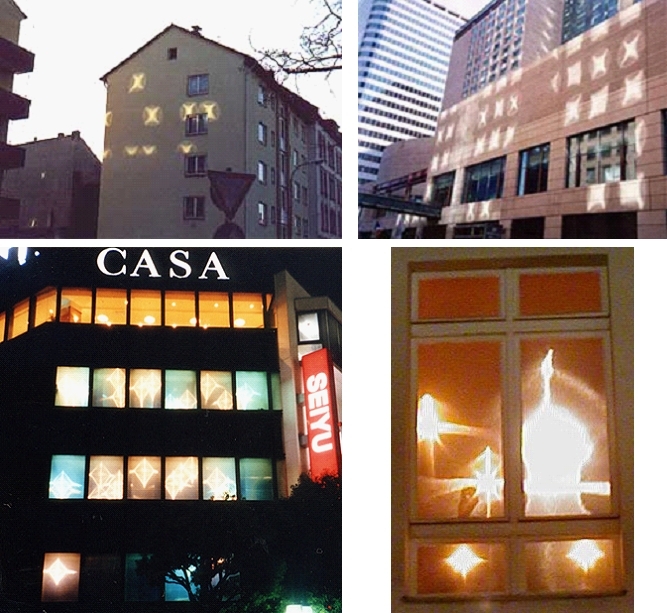 Bright shining crosses floating as holographic images in windows and circles of light appearing on buildings, pavements and other surfaces. Two examples only here: Vassula Rydén receiving messages from God calling man to repentance, reconciliation, peace and unity, and the Theosophical Society is an organization to advance the spiritual principles and search for Truth. Videos showing examples of the manifestation of gold, crystals and gemstones from “out of nothing”. Tens of millions of people of all ages flocked to temples in India in 1995 after it was discovered that statues were drinking milk. It happened again in 2006 and 2010. Video examples of “magicians” walking on water and levitating, people and objects transforming, vanishing and reappearing and other “magical performances”. The “magicians” are merely “actors” performing miracles of God without finding it “necessary” to tell the true nature of these “miracles” to the world, which is that they have nothing to do with the creation of them, but they are given to them as gifts. Man has witnessed miracles of a nature, which the world has never seen the like of before, but still the nature of these was “undiscovered” by mankind because of your lies and distrust! It should have been easy for you to understand my coming, but most of you did not because of your “inability” to understand. My Signs and Miracles pages give examples of some of the very many signs and miracles, which have been given to the world for centuries – increasing within the last decades – to proclaim the now passed Judgment and my reappearance to mankind. 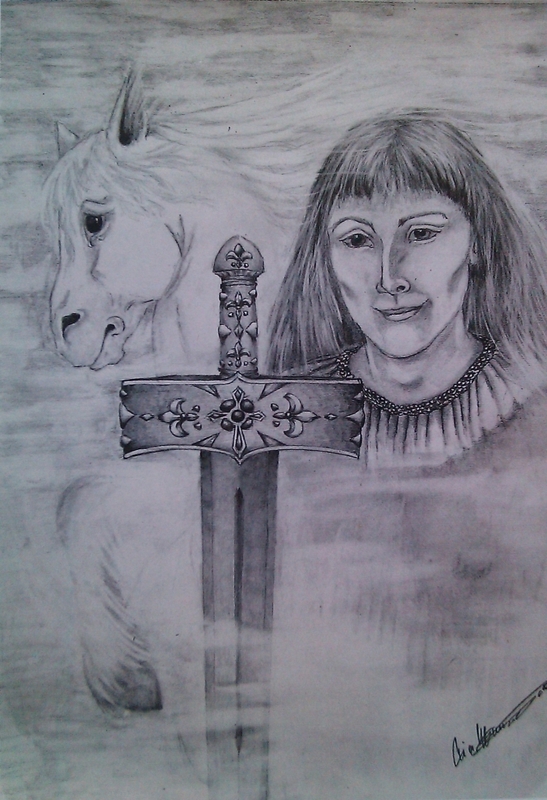 As my “old self” I have not been granted the gifts to perform miracles myself because this would have made the darkness discover who I am herewith eliminating me, but with the coming of my “new self”, there will be no limits to the kind of “miracles”, which I/we will be able to “perform”. Most of the signs on my pages did not receive (much) attention by the media, who had difficulties believing in them without truly discovering and understanding them. Furthermore, the world was “too busy” with “other priorities” and world leaders decided to actively misled mankind when they ordered to play down and directly lie about many signs to conceal the coming of the most important moment in history from mankind. When reading my Signs and Miracles pages and seeing the evidence, you will probably agree that it should have been easy for all including the media and politicians to do as I did myself, which was to (find and) understand what the signs were about, but because of ignorance, negligence, poor communication and deceptions of mankind, many did not hear about the signs, and when they did, most decided to listen to their strong inner voice wrongly telling them that they were hoaxes or of “no importance”. In other words, it was because of poor behaviour, communication and work of mankind that you were “able to” conceal my coming for “ages” at the same time as many have been awaiting me with both patience and eagerness. “My light” in the Heavens is the light of a UFO, which has only manifested once before in history, which was at the birth of Jesus and this “star” has now since Christmas 2008 appeared around the world to herald my emergence. It was in December 2008 that I prepared my journey to Kenya, which I started in May 2009, which was when my mission started, when I started becoming my “true self” and therefore when “my light” started shining as a sign to the world. “My light” is also visible over my home in Denmark together with other UFO “star” lights for example “the light of my mother”, which is hanging only a few hundred metres above my home and often flies as close as 50 metres above me – as one of several UFO’s – as you can see here to show the world the direction to me. You can read more about “my light” from Share International here. 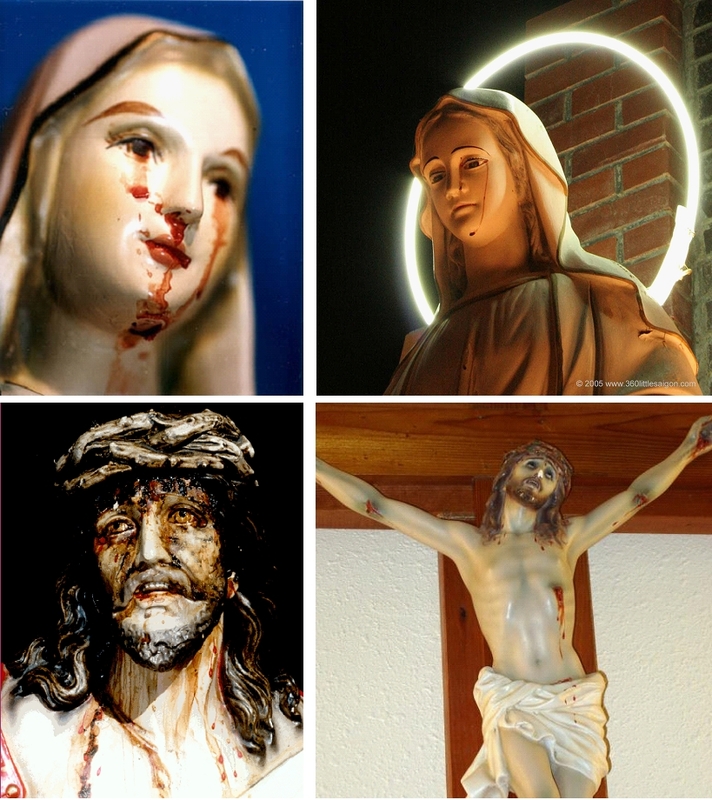 For centuries statues and icons of Virgin Mary and Jesus have been weeping human tears and tears of oil and blood, and since the 1980’s the numbers of these have drastically increased as another sign showing my imminent reappearance unless the sins of mankind would succeed killing me before that is. The following are examples of statues and icons weeping due to the increasing suffering of my mother and I because of the increasing sins of mankind, which we have taken on us to save the world from collapsing/terminating. If we had not done so, the world would have ended years ago together with an ignorant and careless mankind continuing to sin/feast despite of these signs given to you showing you the approaching end of the world – you were tormenting and killing us, which should not be difficult to understand when seeing these statues etc. crying and bleeding (? ), but despite of this, we love you with all of our heart because you are our children as the spirit of my mother here says through me. This is the first chapter of three. A link is given at the end to the next chapter. 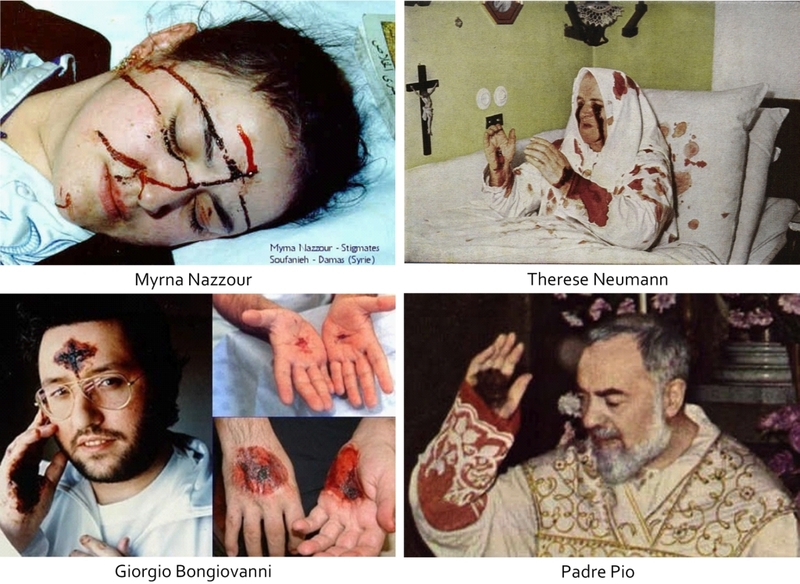 Stigmata are bodily marks reminiscent of the five wounds of Christ and the crown of thorns. The wounds do not suppurate and the blood is pure. Stigmata is accompanied with intense physical and moral suffering. Stigmatization has been given to chosen people for 2,000 years as a sign of my existence and suffering to expiate the sins of mankind. The word “stigma” is Greek and means a “mark” or a “sign”. 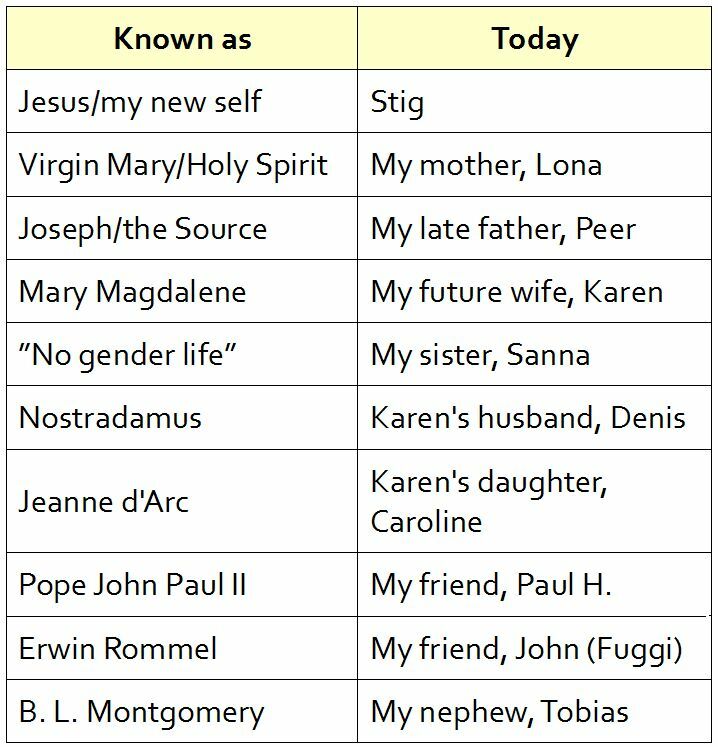 The first four letters of the word may give you an idea of its origination and the reason why my name is Stig – including the true meaning of these signs, which was to show you that the sins of mankind were killing me thus terminating all life if I was not strong enough to bear your sins. Since the Stigmatization of Francis of Assisi in 1224, more than 300 true cases are known. Here are some of them. 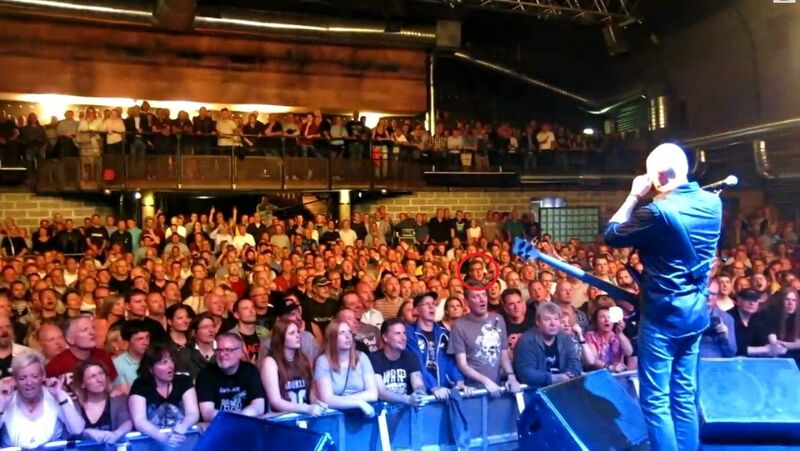 This video explains the history of Stigmata and is the first chapter of two. Saint Padre Pio (1887 to 1968) was a Capuchin priest from Italy, who became famous for his Stigmata, which he received as young and lived with for 50 years. This is the first chapter of six. Myrna Nazzour (born 1964) has since 1982 experienced Stigmata, apparitions of Virgin Mary and Jesus, and exudes Olive Oil with healing properties, from her face, hands and eyes. The Icon of Soufanieh exudes the same oil, which has healed and blessed a vast multitude. The messages of Virgin Mary given to her were the necessity of the return to God; love, penitence, joy, mutual forgiveness, and sanctity; the necessity of evangelisation, of the unity of the family and of the church. This is a documentary on her, which is the first chapter of 31. More videos of the Stigmatizations of Myrna Nazzour can be found here. Click the picture or here to see more examples of signs in food etc. Since 1986 a new phenomenon has appeared all over the world. From one moment to the next suddenly a bright shining cross manifests in a window, which appears to be floating in the “air” like a holographic image. And since 1997 circles of light have appeared on buildings, pavements and other surfaces reflected when the sun shines, and often appearing and disappearing over a period of days and weeks. Watch and feel the healing effects of crosses of lights in the following video and hear how the lights have cured aids, cancer, diabetes, given people the sight and hearing back and how addiction of drugs and alcohol was completely removed. Many more crosses and circles of light can be found here and here. Vassula Rydén is Greek and born in Egypt. God approached her back in 1985 while she lived in Bangladesh in a most extraordinary way to use her as His instrument and charge her with His messages for all mankind. In truth it is a reminder of His Word. In these messages for our times, God is calling us to repentance, reconciliation, peace and unity. The Theosophical Society is an organization formed in 1875 to advance the spiritual principles and search for Truth known as Theosophy. The original organization, after splits and realignments has (as of 2011) several successors. Theosophy is an active philosophical school today, and through a process of schism has also given rise to other mystical, philosophical and religious beliefs and organizations. These are examples of the manifestation of gold, crystals and gemstones from “out of nothing”. The two next videos show gold and silver together with thousands of diamonds, saphires, topaz, emeralds and rubbies manifesting with a purity and cutting of the stones, which is so perfect that they cannot be valued. They also include the story of healing oil floating from the Bible smelling of different aromas and the apparition of Jesus liberating the Pastor from homosexuality. And here, more than 300 people receive fillings of gold in their teeth during one single service. Listen to the Pastor asking a man, who has just received four new gold fillings: “How can God turn porcelain into gold” and the man answering “my God can do everything” and hear two ladies screaming of joy :-). In the last chapter of three, a lady receives the golden fillings right in front of the pastor and a camera. In 1995, an otherwise ordinary man in New Delhi dreamt that Lord Ganesha, the elephant-headed God of Wisdom, craved a little milk. Upon awakening, he rushed in the dark before dawn to the nearest temple, where a sceptical priest allowed him to proffer a spoonful of milk to the small stone image. Both watched in astonishment as it disappeared, magically consumed by the God. What followed is unprecedented in modern Hindu history. Within hours news had spread like a brush fire across India that Ganesha was accepting milk offerings. Tens of millions of people of all ages flocked to the nation’s temples. The unworldly happening brought worldly New Delhi to a standstill, and its vast stocks of milk – more than a million litres – sold out within hours. 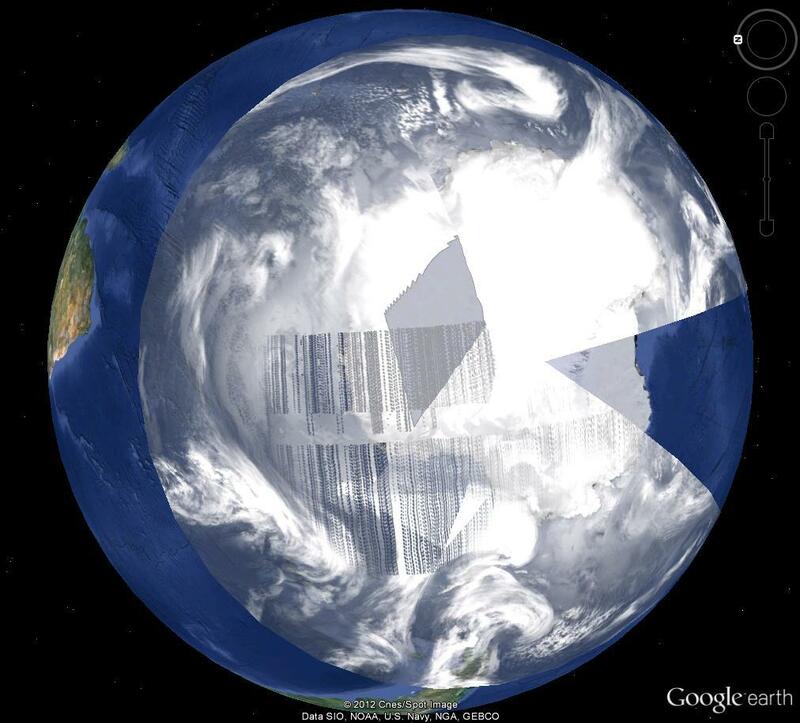 Just as suddenly as it started in India, it stopped in just 24 hours – before the same phenomenon was repeated in 2006 and 2010. You can read more about milk drinking statues here. As my “old self”, I have not received the power to do “great magic”. This power has been handed over to so called “magicians”, who perform true miracles as “actors” when they levitate, walk on water or up and down walls, make people, animals and even large objects vanish into and reappear from thin air, transform one object into something else and much more as you can see a few examples out of many thousands in this chapter. The power of “pure magic” has been given to “magicians” as lessons to the world to see if they would tell the truth about the true nature of these miracles, which is that the “magicians” merely are “actors” performing miracles of God, which they have nothing to do with themselves, which therefore are signs of “something to come”, or if they would be “tempted” to keep their “gifts” as secrets giving mankind the impression that they are so skilled that they can carry out “magic of God” also giving them fame and fortune as a spinoff and this is exactly what most decided to do! These selfish “magicians” use “magic” burning off almost no remaining light of the world to entertain the world without telling the truth of it and to make a good living themselves, and in this respect, they are similar to “clairvoyants” abusing light for the sake of pleasure and filthy lucre instead of helping me to save the world by telling the truth of darkness/light, the end of the world and the Source of their “magic” to make the world understand what it “could not” understand itself being absolutely convinced that this is “fantastic illusions” made by these “magicians” themselves. The magicians/illusionists Criss Angel and David Blaine are “other parts of me” performing the greatest miracles ever shown to mankind of magical tricks – see examples of both Criss Angel and David Blaine below – and “endurance stunts” both to document my arrival and also my sufferings through the unimaginable pain David Blaine has taken on when performing stunts like “frozen in time” (see below), “drowned alive”, “vertigo“, “dive of death“, “above the below” and more, where he was very close to dying several times – as I was too – because of the sufferings he took on him because of the sins of mankind, which he showed directly to a gaping world to make the world understand the consequences of its wrongdoings, which mankind however was “not able” to do, but when you look at his stunts with new eyes, it may be easier for you to understand (? ), and when doing his work, David also helped me to absorb darkness to save the world, thank you very much both of you :-). Lies and distrust of mankind made CLEAR signs of my coming undiscovered! Thus, these miracles were also a test to see if mankind would be able to understand the true nature of them being performed right in front of them or if they would decide to listen to their own ignorant and very strong voices telling them that these miracles are “mere illusion tricks but very well performed” or even camera tricks, which most people did with some even being “clever enough” to “reveal” (by guessing based upon their ignorant but still better-knowing voices) just how these tricks were carried out as it can be seen from comments to the videos below and many others when watching these at the website of YouTube and others. This is yet another example given to mankind to show your poor behaviour, communication skills and your inability to understand what should be easy to understand. For years, you have witnessed miracles of a nature, which the world has never seen the like of before, but still the nature of these was “undiscovered” by mankind because of your lies and distrust. Do you see that you have to improve? When using “simple logic”, do you believe human beings can walk on water or that Criss in the following is a sign of the coming of Christ? And do you connect the ability to fly with human beings (?) or do you believe levitation of Criss and David as the following videos show are another sign? “I’ve met CA in person & i confirm he’s the 13th disciple of Christ. The Illuminati have light & dark branches, the dark branch abuses the true illuminati symbols, but Criss restores their lightness. When he levitated above Luxor he said “dear Jesus keep me in you”. I’ve seen his demonstrations personally, what he does is what WE will do when we are dressed in garments of light, then we’ll be unlimited and will be invisible at will. Rejoice, dear friends!”. The following videos are examples of people and objects transforming or vanishing into and reappearing from thin air – can you do this yourself as a “normal” human being? 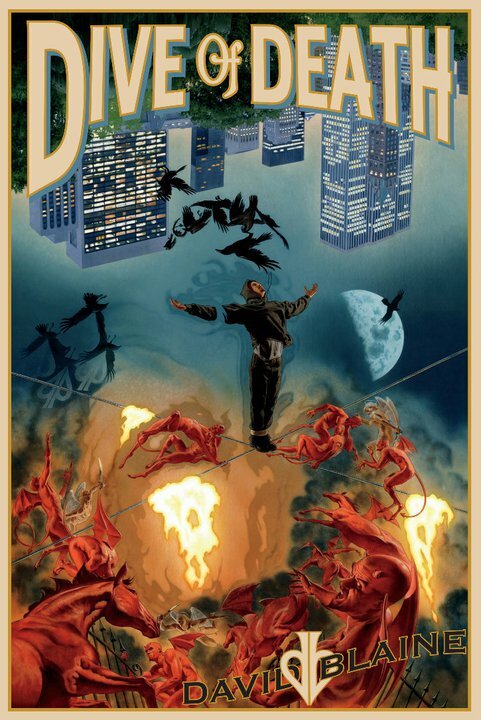 Finally, here are some examples of other “magical performances”, where mankind should have concluded that this is “impossible to do” and that what you see is magic of Heaven telling you of “something to come”, but this was “impossible” for you to do (?) even though this is what you see! 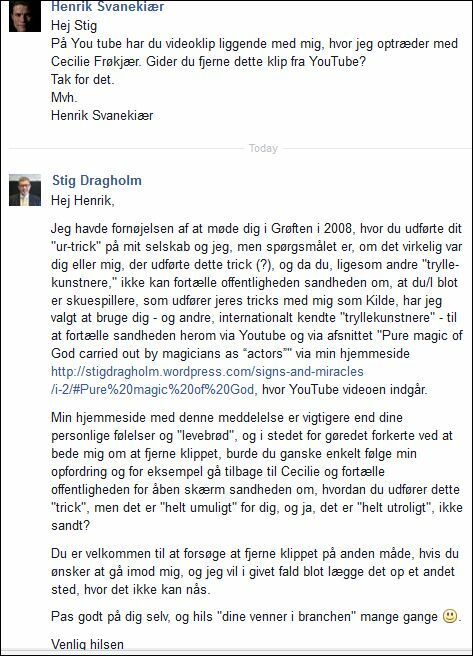 The Danish “magician” Henrik Svanekiær asks me to remove my video clip on him because he claims to do “mental shows” and he wants to protect his livelihood! I uploaded this clip from Danish TV2 from 2005 with the Danish “magician” Henrik Svanekiær in 2011 after downloading it from his own website, and it has been on this very website ever since. I met Henrik Svanekiær at the “Grøften” restaurant in Tivoli in Copenhagen in 2008 together with colleagues and British guests of Dahlberg Insurance, where I worked at the time, and Henrik performed his “watch trick” asking one to write down a time on a piece of paper and another to take off his watch and put it with its upper-side facing down on the table and turn the button adjusting the time without seeing what he did, and he was asked by Henrik to “stop when you feel like it”, which he then did after a while only for all to discover that he had stopped the time at exactly the same time as the other person had written on the piece of paper (!) making everyone astonished, and furthermore, Henrik conjured away my watch from my arm and onto his, and all of this was done via “pure magic” of the Source with Henrik merely acting as an actor. It is exactly the same trick as he does in this clip from 2012, which was brought on the Danish DR2 TV channel. This is what Henrik and his fellow “magicians” do for a living keeping it a well guarded secret that they are only actors carrying out this magic of God, and finally, on November 27, 2014, Henrik could not keep away any longer because it was annoying to you, Henrik, to have the truth of what you do lying public on the Internet for everyone to see (? ), and this is how he asked me in this Facebook email to remove it, and I could only ask him if it was he or me, who did this trick, and when he “cannot” tell the public the truth about this, this is why I tell it on YouTube and on this website, which is more important than his personal feelings and livelihood, which is why I will NOT remove it. I felt him for hours after sending my reply. 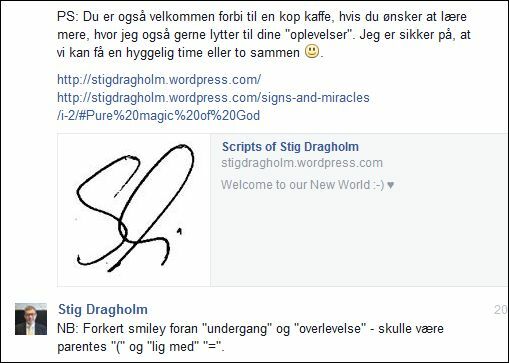 This also happened a few days after finishing all of my writings and Facebook updates, and shortly before MAGIC will happen with the opening of our New World, which faith of Henrik in me will also help providing. 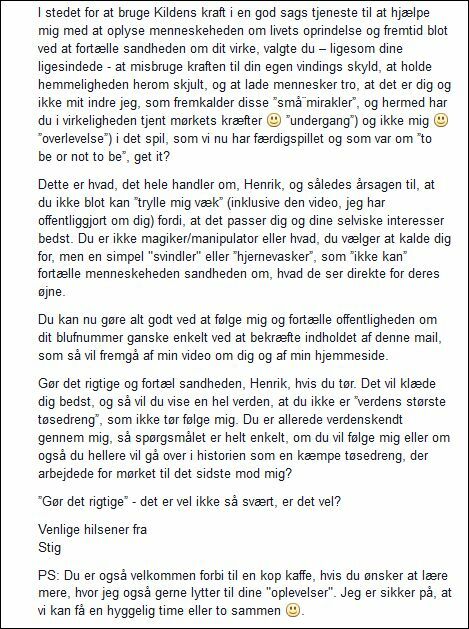 On December 4, 2014, Henrik decided that he had not had enough and he wrote me a new email asking me to remove the video. 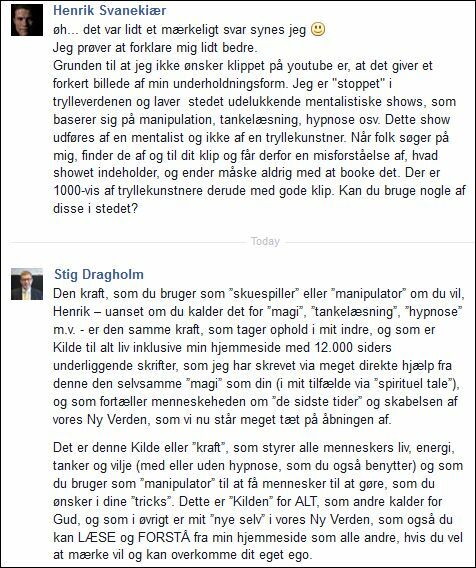 He claimed that the reason is that he has stopped as magician and now does ”mental shows” based on manipulation, mind-reading and hypnosis, and my video brings people a misunderstanding of what his show is about, which may make people decide not to book him! I could only tell him even clearer that the power he uses as “actor”, “manipulator” (or “magician”) is the power of the Source of all life, which is my inner self and also the Source of my website and 12,000 pages of scripts telling man about the end times and creation of our New World. Instead of abusing this power for his own selfish purposes and letting man believe that he himself is the creator of this “magic” or “manipulation”, I encourage him to follow me and confirm my story to the world if he has the courage to do so, but maybe he is also a giant WIMP as everyone else? While writing my reply to Henrik, I was told by the Source how close Henrik and I are on each other and that it is “me”, i.e. the Source as my inner self, who is doing this “magic” and “tricks” that Henrik takes the honour for doing himself. Signs and Miracles continues in part II here. This website was first published February 18, 2011, and has since been updated some times.